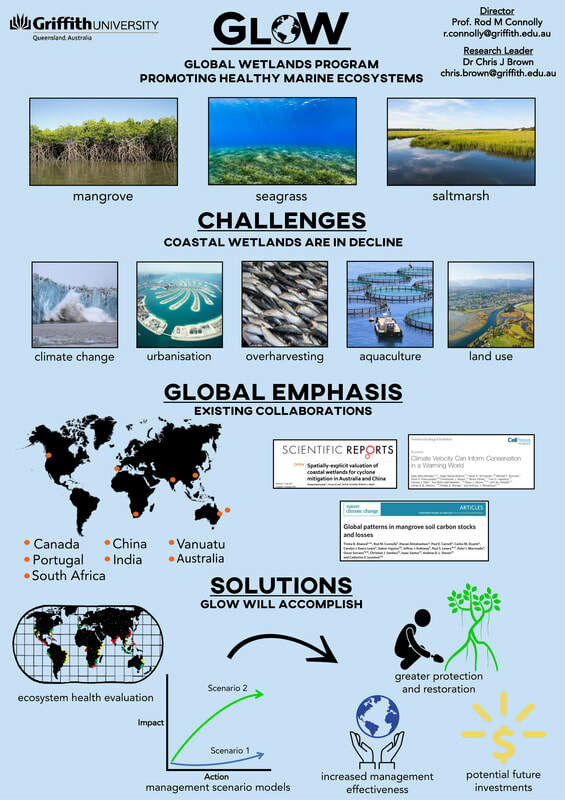 ​A program developing and applying globally applicable assessments of coastal wetland health to drive actions and investments towards protection, restoration and improvement of wetlands worldwide. Coastal wetlands – mangroves, seagrass, saltmarsh and estuaries – are valuable ecosystems with high biodiversity. Long favoured as sites for human settlements, they provide us with safe ports, fisheries resources, and access to fresh water. They are critically important in the production of seafood and they assist in protecting coastlines from extreme weather events, now and as sea levels rise. However as the world’s coastal cities continue to grow and industrialise, many coastal wetlands are facing major declines in ecosystem health. We will shine a spotlight on where the problems are, and show what needs to be done to protect what we have and where rehabilitation will be most effective. build web-based scenario models to help conservation-focussed projects identify cost effective options for protection and rehabilitation. ​Gamtoos River, Eastern Cape, South Africa. ​Ria de Aveiro, Aveiro, Portugal. Pearl River, Hong Kong, China. ​Port Resolution, Tanna Island, Vanuatu. We are seeking a postdoctoral fellow in Aquatic Ecology to work on coastal wetlands and environmental accounting. Supervised by Dr Chris Brown in collaboration with Dr Mark Kennard and Prof. Rod Connolly. This is a 2 year position.